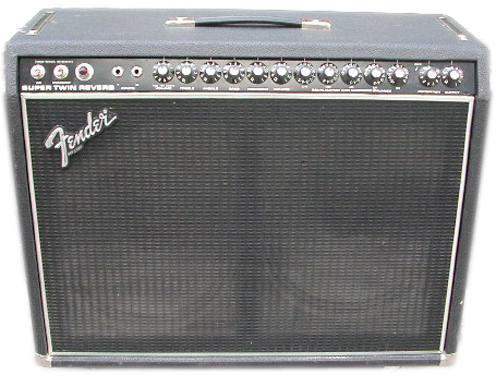 I need a power output transformer for this Fender super twin reverb amp. no luck with fender , please contact me at 305 232 6790 or email at tubegait@yahoo.com. name is Rick Of Ricks guitar and amp repair in miami, fl. my fender super twin reverb has a bias jack on the backside. I can’t find it on the schematics. does anyone know where the bias jack is connected? #1 WORST amp I ever owned. Pure live garbage. This amplifier slays most out there. However, you have to know how to use it, and what you want from an amplifier. As with most, sound is subjective. If you are in a cover band, this amplifier is perhaps not for you unless you play Melvins or Country Western. The supertwin is great with slide guitar, and bass. It is also extremely powerful metal guitar with the correct distortion pedal (I use an old 84 ProCo Rat, and a early 70s Roland BeeBaa (best Bass fuzz ever BTW)). It also helps to use very powerful speakers. I switch between an EVM15B (400 watt) and a EVM12L (300 watt). I Have a SUPER TWIN REVERB…I think the best Clean Sounding Amp Fender ever made…I have had mine since 1988 never let me down once…Its never been serviced..I have just replaced all the Tubes..Fist time in 26 Years…and the only noticeable difference is the amp is a little more quite…I use mine for Clean Rockabilly Playing..the Bright switch and the Presence knob make all the difference….The only down side is the weight…But I have bought another vintage Fender amp Super Reverb..And while lighter …when you have a sound guy who does not know what he is doing….you wish you had brough the Super twin Reverb..Because as far as clean head room, there is no limit…the only limit is how much you value your hearing!..With this amp you are in control of your sound and how you are perceived in the mix of your band…The Amp get a 10/10 from me….Keep in mind this is the amp that made Ted Nugent deaf! Mightiest amp I ever had. What a monster! Not only in weight, but also in sound. REALY clean sound up to getting deaf within minutes. Ted Nugent used 6 (!) of them on stage. Very weird, thats what I hate. No distortion even at very high levels. Very good sound. And variable sounds, there are “presence” and “bright” knobs. Loudest amp I ever had, and it truly rocks (the walls of your chamber). The “distortion” knob is just a joke, completely useless, when in use, the amp sounds as if broken down and heavily destroyed. 365 W power consumption, so if you need a heater during winter … But wonderful full sound at very low levels (i.e. “volume” 4-5, “master” 2-3)at home. And, as said, a monster on stage. And super sounding reverb as most fenders. Use it mostly with Hughes&Kettner Cream Machine, Boss CE-3 Stereo-Chorus, Ibanez DL 10 Delay, Dunlop CryBaby. Just love the sound. AC. Standby. 2 Input jacks. Volume (pull: bright). Trebble. Middle. Bass. Presence. 5-band EQ: 2300, 1250, 485, 235, 100 hz. The horrible “distortion” knob. Output. What I forgot: 6 x 6L6, not easy to get a well matched set. Hey, i am very hopeless in a question of external outputs. Somewhere i ve read that some fender twins of late 70ties/early 80ties have some internal switch so while you plug 2cabs into both speaker outputs than total impedance changes to 8-ohm. So you can connect two 4-ohm cabinets. Dont you know where is the truth please?? is there anywhere i can buy the white trim around the amp. I also own the Fender Super Twin without reverb and mine has a fantastic sounding distortion on several different guitars. Dialing in the Keith Richards tone is easy. Getting a Judas Priest tone requires my Big Muff. I think it’s the best sounding amp I’ve had. The most powerful amp I owned was a Sunn model T.
I have one with no reverb don’t know what year it is,has 2×12 e120 jbl.awsome for my steel guitar. I HAVE A 79.BOUGHT IT NEW.SHE’S A BEAST.REPLACED THOSE SPEAKERS WITH EMINENCE SWAMP THING. I PLAY PEDAL STEEL THROUGH IT.RECAPPED ONCE.FORGET THE DISTORTION.HEAVYYYY.WATCH YOUR BACK. I have a super twin reverb that blows a fuse when I turn it on whats the problem and how do I fix it?